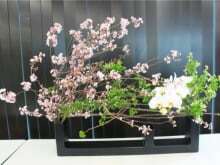 I joined Sogetsu School in 1990 and have learned both old art Ikebana and contemporary flower arrangement. During my stay in Germany for two years, I attended classes of one of the great florist. There I saw that Ikebana gives a huge influence to the European arrangement. I enjoy communicating with you through Ikebana. We enjoyed the Ikebana class very much. Hoko was a great teacher, and she and her family (the class took place at her home) were very kind. After showing us some examples of Ikebana works and demonstrating how to arrange flowers in two different styles, Hoko helped us to create our own Ikebana works. Thanks to her support, we got to make some beautiful arrangements. We're now looking forward to make some at home! Thank you for the interesting and fun time!